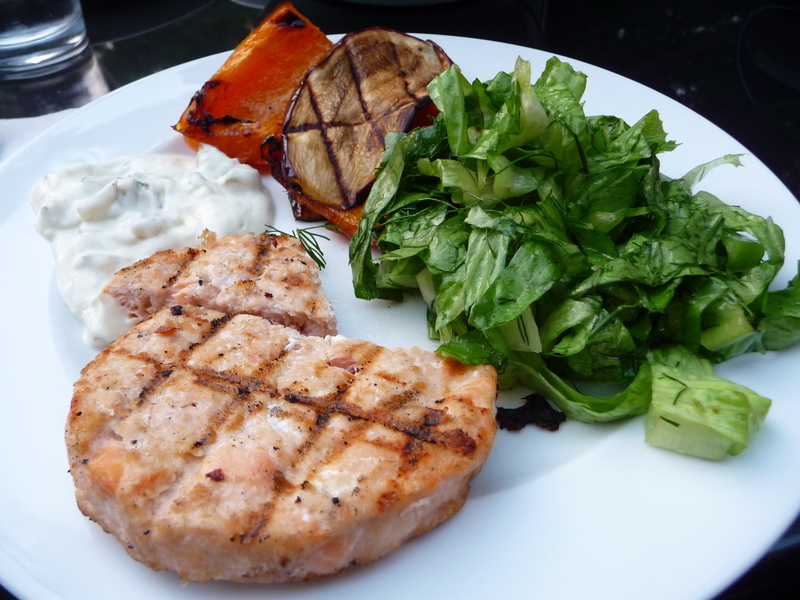 Of course, as with anything else, the more we eat salmon, the more we look for new and different ways to prepare it. A few nights ago, the salmon filets in our fridge and my craving for sushi-like flavours conspired to lead me toward creating something new, while still being quick and easy. By combining a layer of wasabi paste with a crunchy panko crust, and serving the salmon with a ponzu soy reduction, I managed to fairly successfully duplicate the taste of a maki roll, while cutting out most of the carbs of a sushi dinner. Jenny decided to make a simple salad of thinly sliced fennel and orange segments, tossed with the juice of half an orange, a little olive oil and some vinegar, which was light, summery and complemented the main dish nicely. 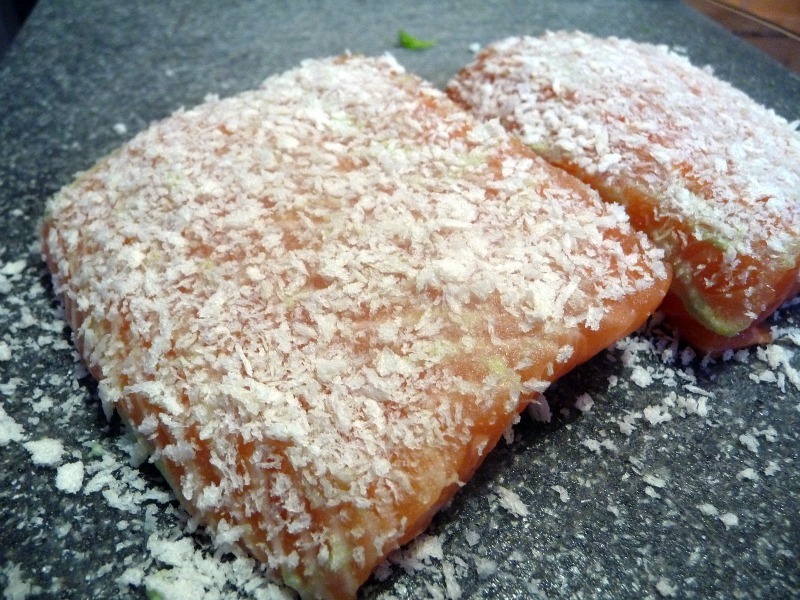 Rub one side of skinless salmon filets with a thin layer of wasabi paste. Coat the wasabi-rubbed side with a generous amount of panko bread crumbs, pressing the panko gently into the salmon to ensure it sticks well. Coat a pan with a thin layer of olive oil, and heat over medium-high heat for several minutes. When pan is hot, place salmon filets panko side down, and cook about four minutes, until panko starts to brown and develop a nice crust. Flip over and cook another three or four minutes. Add 1/3 cup of ponzu soy sauce, 1/3 cup of fresh lemon juice, 1/3 cup of gin and the zest of half a lemon to a small sauce pot over medium-high heat. Allow liquid to come to a gentle boil, then turn heat down to low and simmer, stirring occasionally for 15 minutes or until the amount of liquid has reduced by at least a third. (Resist the urge to walk away – keep watching and stirring regularly, in case the liquid starts to boil again and you’re left with a sticky, useless mess). Plate the salmon and top with a drizzle of the ponzu soy reduction. Serve alongside the fennel-orange salad. Recently a friend asked me “Do you guys ever make anything bad? Do you ever screw up?” Though I would like to have answered “No. Never. We’re perfect. In every way,” that is far from the truth. Neil and I love to cook but we have a ton to learn and we do, of course, sometimes screw up. A Parmesan ice cream incident and a tofu cupcake mishap are among two of the worst. We just don’t post about the screw-ups! I know it may also appear that we’re constantly busy cooking up delicious things, but just like most other regular day-job-holding home cooks we have our moments of “Let’s just order a pizza” or frequent nights when we’ll get home from work, look at each other and say “What should we do for dinner? I don’t feel like cooking.” That’s usually followed by blank stares and silence, followed by whining (mostly be me), and usually ending with Neil suggesting take out sushi from our favorite place or burgers from one of the many burger joints in the east end and me vying for vegetarian or Moroccan food from around our hood. Sometimes we’re in the mood to eat at home, but are more interested in easily assembling something instead of actually cooking. 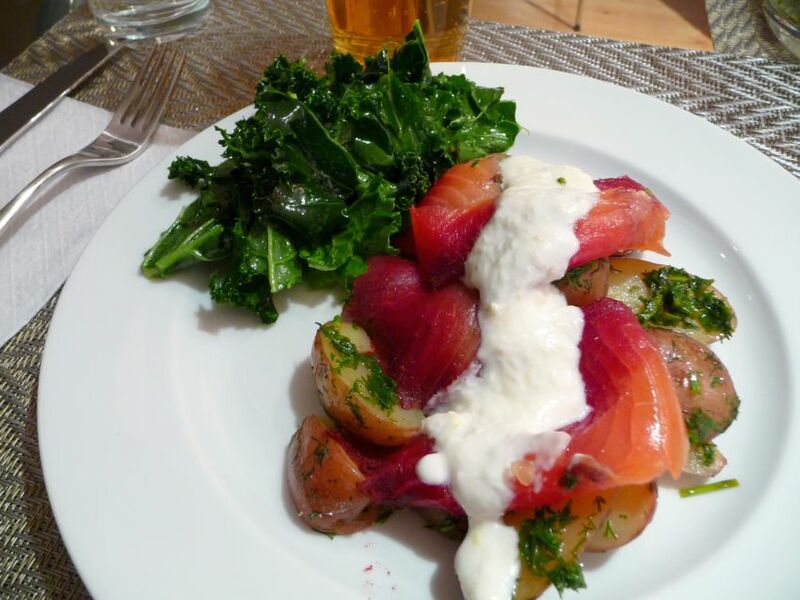 We have a few go-to meals for such occasions, and one of those is dilled potatoes with smoked salmon and a very leafy green side salad. I once saw my celeb crush Jamie Oliver make this easy meal on his beautiful show Jamie at Home. I didn’t write down the recipe (because there really isn’t one) but the idea stuck with me and we’ve been making it ever since. Jamie is known for using really fresh, simple ingredients and producing dishes that are bursting with flavor. I love how he just adores every ingredient he throws into a dish and speaks of each one like they’re all his little muses. This meal is not fancy or fussy but it tastes amazing and is really quick to throw together if you have all the ingredients in your fridge. It took us 20 minutes from starting to sitting down at the table. 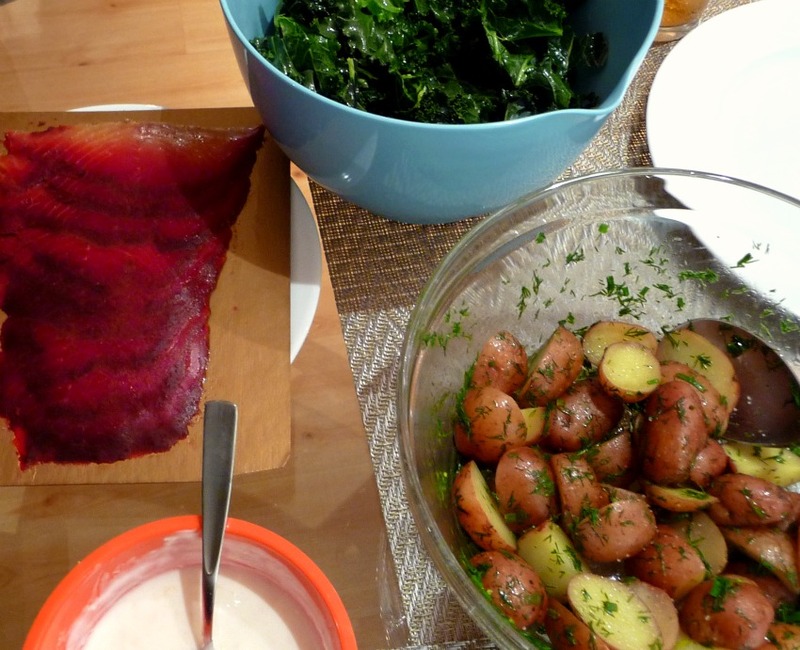 If you’re wondering what’s up with the rainbow smoked salmon in the photos, we decided to try President’s Choice Vodka Beet Smoked Atlantic Salmon, mostly because it was on sale, but also because we were curious. It’s really beautiful and would go over well for a nice brunch or dinner party, but we didn’t really think it added much to our dinner, aside from some nice color on the plate. The taste is really no different from their regular smoked salmon, though it may have been a bit less smoky-flavored. 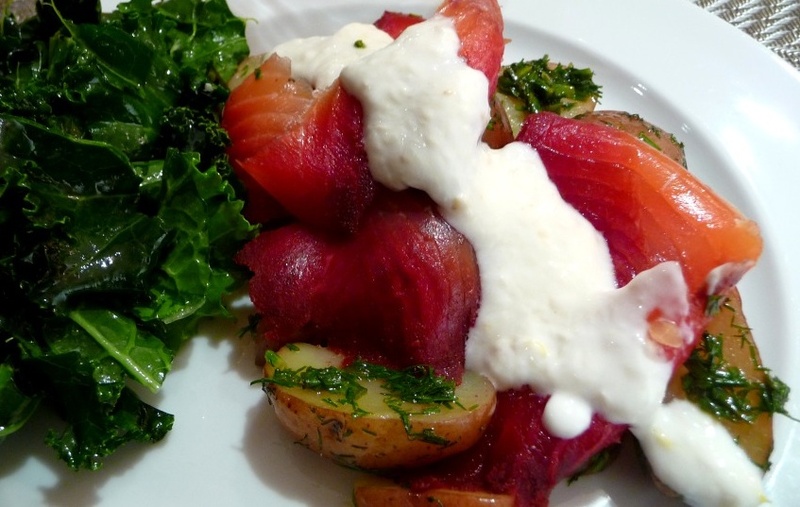 I actually like to use gravlax for this meal because it’s thinner and more delicate and kind of melts in your mouth, but any smoked salmon will do. Don’t skimp on the herbs for the potatoes though – they really make the dish. And I find that the horseradish sauce just brings it all together nicely. We’re big fans of horseradish sauces for lots of different dishes, as evidenced here and here. The other night when we made this, we served it with a simple raw kale salad dressed with olive oil, lemon juice and a touch of maple syrup. And I have to say, this dinner pairs well with a really good cold beer on the side. We had Beau’s All Natural Lug Tread Lagered Ale (we’re really loving their beer as well as their cool packaging) and it was the perfect complement to our simple but fulfilling Jamie O-inspired meal. If you’re using frozen smoked salmon, take it out of the freezer a few hours before eating and let it thaw in the fridge. We like to cut the potatoes into halves or quarters, depending on their size. Place potatoes in a steamer and steam until soft. We actually steam ours in the microwave for approximately 10 minutes. Meanwhile, mix all sauce ingredients in a small bowl. I never measure; just use your judgment and adjust to your taste. Get your herbs and oil and vinegar ready so you can quickly work with the potatoes while they’re steaming hot. Prepare your salad. Once the potatoes are done, transfer them to a big bowl, add in the herbs, drizzle in olive oil, vinegar, lemon juice and a good amount of sea salt. Bring everything to the table and let everyone serve themselves. The best way to eat this meal is to take a heaping spoonful of potatoes and then top them with pieces of smoked salmon and a little bit of sauce. Try to get a little bit of everything in each bite. I have learned so much about cooking from Neil’s family. They’re all amazing cooks who aren’t afraid to try something new. But I’ve really taken a lot of inspiration from the Italian side of his family and their simple and classic dishes. 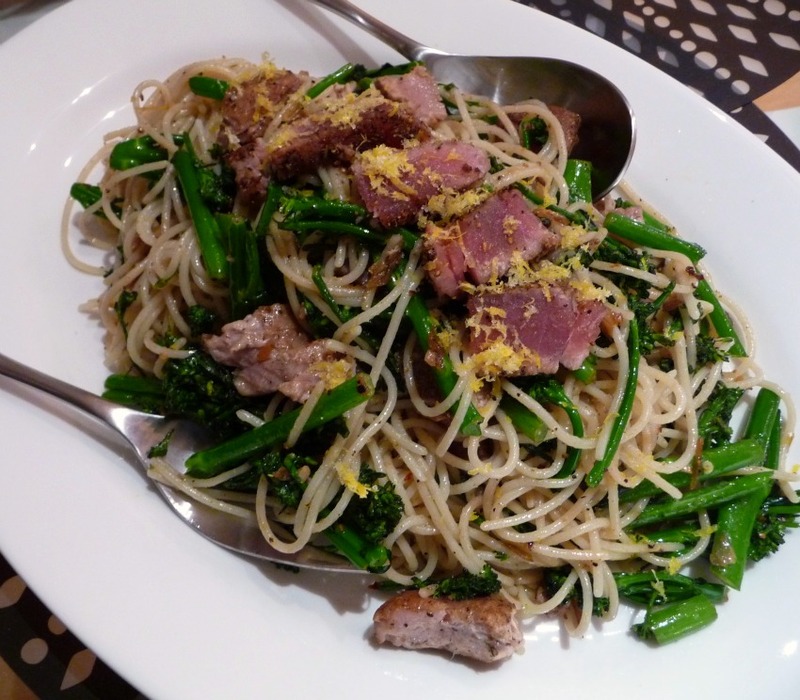 His classic version consists basically of long pasta noodles (like spagettini), a can of tuna packed in oil, lots of garlic, olive oil, hot peppers or chili flakes and rapini or broccolini. It was a staple of Neil’s childhood and something that we now crave together and are sometimes lucky enough to have made for us. My newfangled version came to be when my sister and her boyfriend were coming over for dinner. 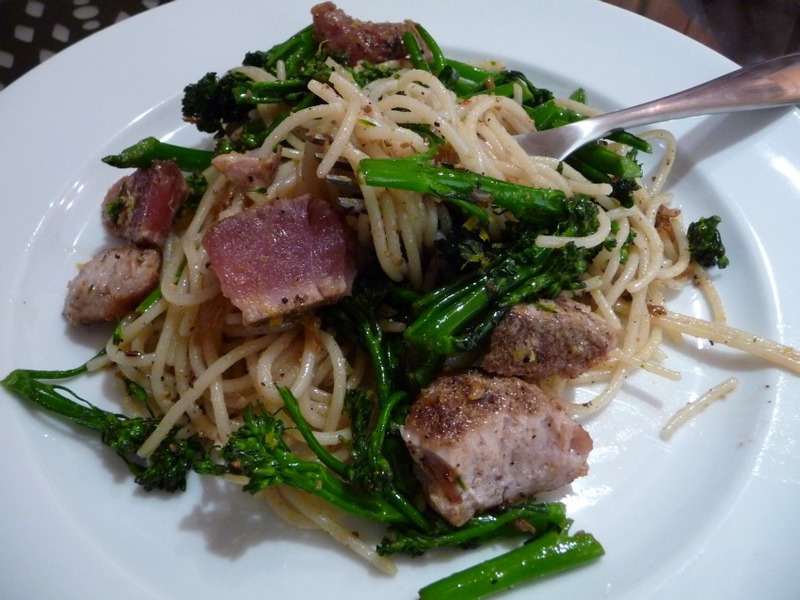 I knew that my sister hated canned tuna but happened to love fresh seared tuna steak. She has champagne taste, that girl. So I decided to make a tuna pasta but using fresh tuna instead of canned. 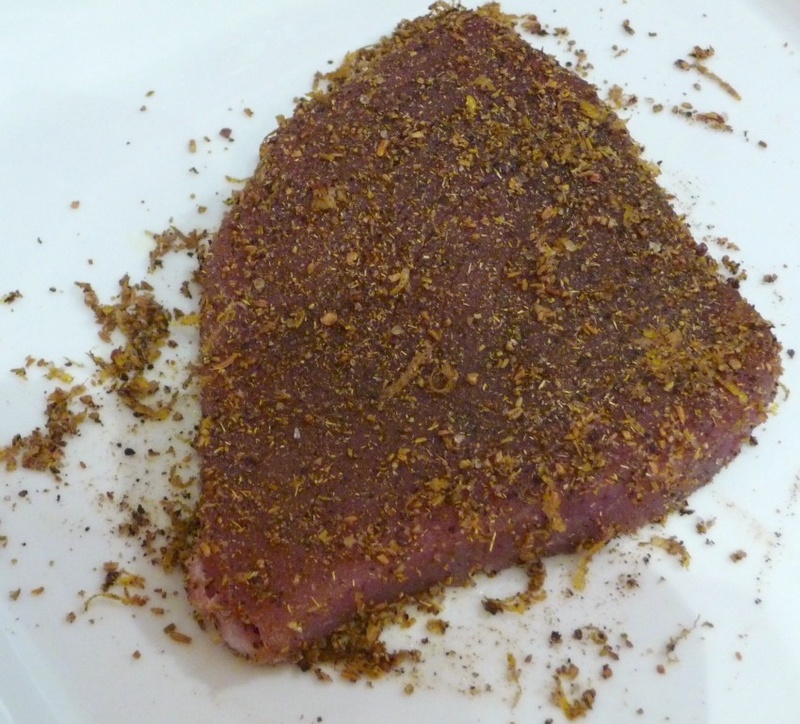 I knew I needed a rub of some sort and the first spice that I could think to use was fennel seed. Fennel is a great compliment to fish and I figured it would work well in this dish. I had never toasted fennel seed myself but tested it out for this recipe and my kitchen was immediately warmed by the scent of toasting fennel. It’s so fragrant and lovely. 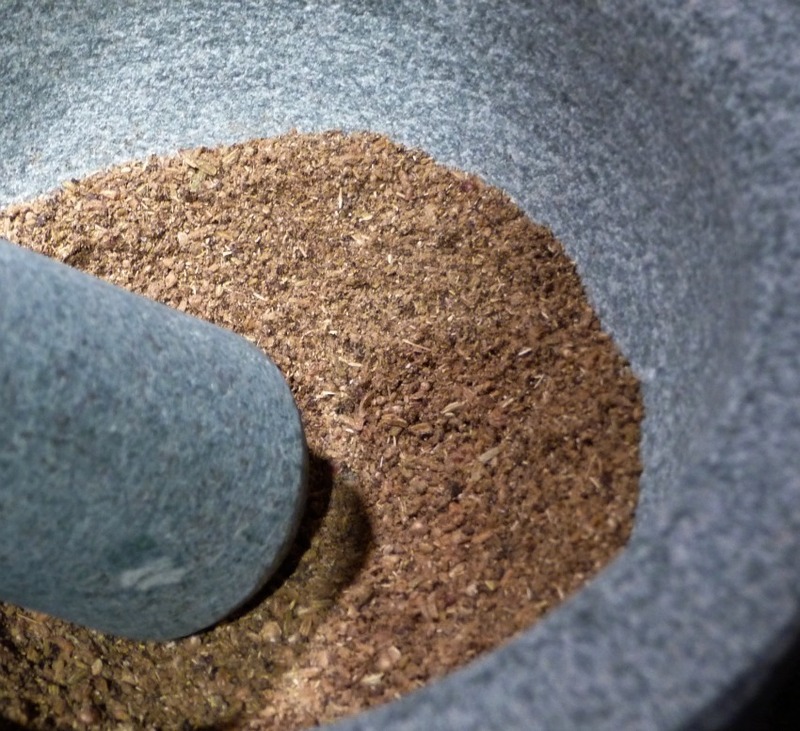 The first time I made it, I used a coffee grinder to grind up the spices but we recently got a good mortar and pestle (a kitchen tool that we should have owned ages ago) and I really like how the rub came out using it. This pasta dish takes everything that’s great about the classic version and brings it up a notch. And it’s really not that hard to make. It’s another one of those meals that looks like it should have been hard, but comes together in a snap. Just get organized, chop and set up all your ingredients beforehand and it’ll be a breeze. Mix the freshly grated lemon zest with the sea salt and set aside. In a small pan, toast the fennel seeds and peppercorns on medium low heat for about 3-4 minutes. Be careful not to burn them. Keep them moving in the pan with a wooden spoon. 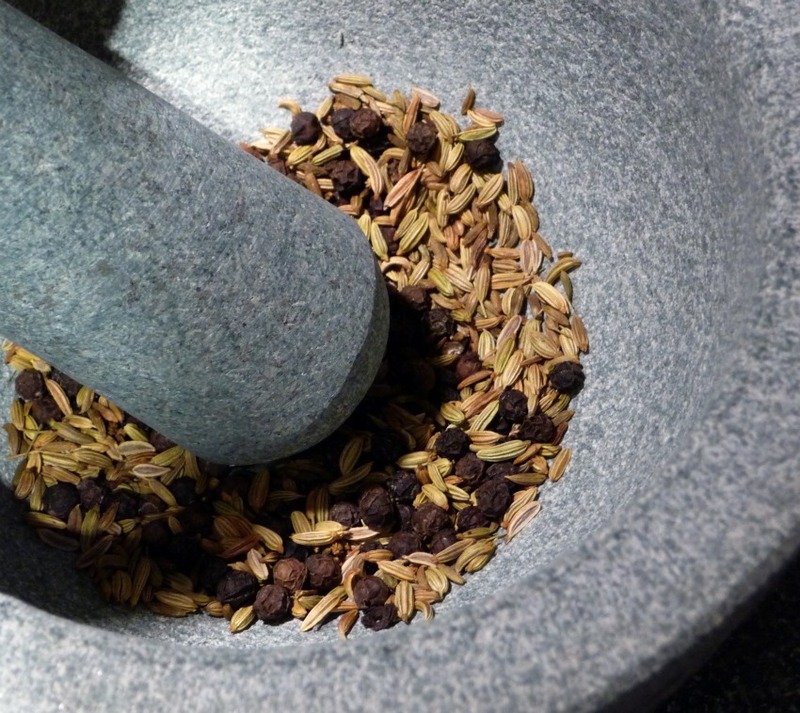 Remove from heat and put them right into a mortar and pestle or coffee grinder. Grind into a fine powder. In a bowl, mix the fennel and pepper powder with about half the amount of lemon salt. Set the rest of the lemon salt aside for garnish. Lightly brush some olive oil onto each side of the tuna steaks and then coat both sides with the fennel, pepper & lemon salt rub. Lightly oil a large sauté pan and set on medium-high heat. Give it a few minutes to really heat up. Sear tuna steaks for a few minutes on each side, making sure not to overcook. You want a nice crust on the outside and a rare middle. You’re going to add the tuna back into the hot pan later on where it’ll cook a bit more so keep it on the rare side. 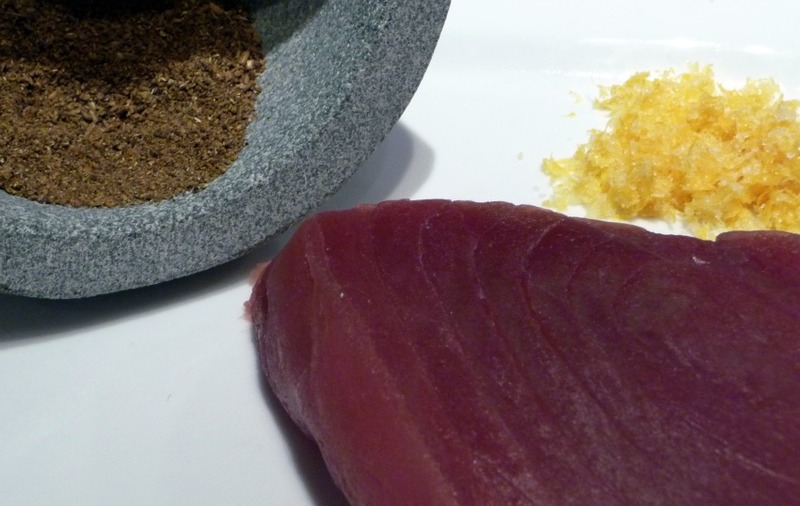 When the tuna is done, remove from heat and cut into thin slices or small chunks. Set aside. Boil your pasta water (with salt!) and get your pasta cooking. Using the same sauté pan that you used to sear the tuna, add a good amount of olive oil and return to a medium heat. Add in garlic and shallot and sauté for approximately 3 minutes. Add the broccolini or rapini and sauté for a few minutes. We used broccolini and added about ¼ cup of water into the pan to help it steam and cook but Neil thinks rapini wouldn’t require as much water because it’ll wilt on its own. Use your judgment. You don’t want liquid in the pan, you just want to get the broccolini a bit wet and it’ll absorb the water as it cooks. It also helps loosen the bits on the bottom of the pan. Add in chili flakes and anchovy paste and mix. 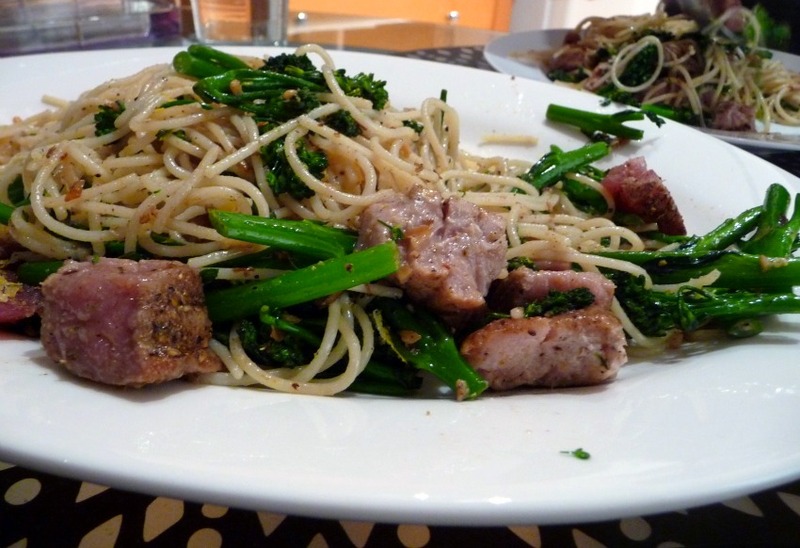 When the pasta is ready, strain and add directly into the pan with the broccolini mixture. Drizzle good quality olive oil overtop and mix well. Add the tuna into the pan and toss with the pasta. Transfer to a serving platter and sprinkle the rest of the lemon salt overtop. Serve hot. You can serve this pasta with some freshly grated parmesan cheese, even though it’s not traditional to put cheese on top of a fish-based pasta. Clearly though, we’re not averse to breaking tradition. Thanks to my fabulous sister Jayme for being the driving force behind the creation of this recipe! You know those nights when you’re pressed for time, your fridge is basically empty and the thought of cooking makes you want to cry? Tonight was one of those nights at our house. They seem to be plentiful lately. But it’s quite the coup when you figure out how to overcome those shortcomings and still end up with something healthy and delicious. Hence this post! I wanted to share a little last-minute meal that was a combination of convenience and inspired innovation. It all started when we remembered that we had a package of salmon burgers in the freezer. We usually don’t like to buy packaged burgers and prefer making our own, but who’s kidding who? That’s just not possible sometimes so it’s always nice to have some backup ready to go in the freezer. I bought PC brand Blue Menu ‘Wild Pacific Pink Salmon Burgers’ a while ago and was a bit skeptical about how they would turn out. I feared they would taste scarily reminiscent of cat food or at least like canned salmon (I know, why did I buy them in the first place?! 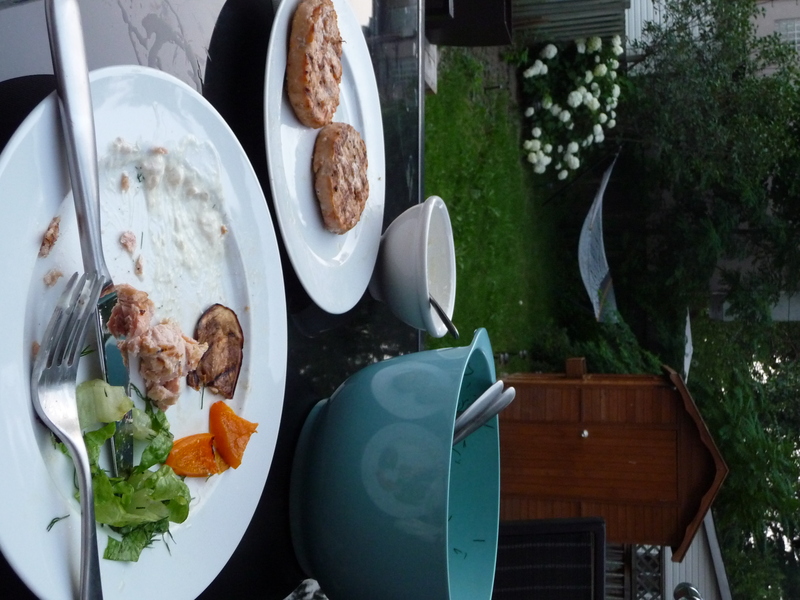 ), but I’m happy to report that they were surprisingly delicious and full of real chunks of salmon that tasted great. I highly recommend them and will definitely buy them again. We needed a quick salad to go with the burgers and I decided to try my own version of a fantastic salad we recently had at an amazing new Greek takeout restaurant in the east end called Folia Grill. Their food is so fresh and clean tasting – which to me is very impressive for a fast food Greek place. Nothing leaves you feeling greasy or heavy, the ingredients are fresh and you can tell it’s all been cooked and devised with a lot of thought and care. The owners bring in a special olive oil from Greece that you can really appreciate in their salads and on their grilled peppers. Honorable mention to the chicken gyro (the first I have ever eaten that hasn’t made me feel sick by the last bite; it’s non-greasy and full of smoky paprika flavor) and the pork souvlaki, which Neil absolutely adored. But the pièce de resistance was Folia’s Romaine and Dill salad. So fresh and delicious, I had to try to make it at home. I’ll admit, mine wasn’t nearly as good as theirs – I don’t have the dressing quite right yet, but just the idea of this simple salad is so wonderful and such a great melding of flavors. And then I needed a little sauce to go along with the burgers so I came up with my own healthier version of tartar sauce, completely inspired by what we had in our fridge. It came out pretty good, I have to say! All of that paired with some grilled peppers and eggplant that I cut and tossed in olive oil and balsamic in about 5 minutes and then BBQ’d, and we ended up with a killer last-minute meal. The whole thing took about 20 minutes to prepare and cook, leaving me with ample time to enjoy my prized backyard hammock, pictured below. The hammock was my 30th birthday present last summer from my amazing husband, and it is pure bliss. My ‘happy place’, as I call it. There’s nothing like coming home after a stress-infused day (every day!) and surrendering yourself into the comforting embrace of a hammock. Make sure you buy some really green and crisp romaine leaves, and cut them into thin strips. I rolled the leaves up like I usually do with basil and cut strips from there. Chop up a ton of fresh dill (no measurements – it’s a quickie dinner!) and add it right into a bowl with the strips of romaine. Drizzle with a good strong olive oil, some white wine vinegar, coarse sea salt and I drizzled on a bit of honey for sweetness. Mix and enjoy! Mix in a bowl: low-fat sour cream, hot white horseradish, lemon juice, a bit of dijon mustard and 1 chopped dill pickle. Again, no proportions, just go with it! Don’t miss out on our adventures. Click below and get new Communal Table posts sent straight to your email!